The LANAP protocol is a comprehensive approach to gum disease using an Nd:YAG free running pulsed laser requiring specific knowledge and skills drawn from the newest technology in dentistry. To you, the patient, this means: less pain, less bleeding, less swelling, less tissue removed, less down time, and less recovery time which is decidedly less costly to you and your employer. We use the LANAP protocol to treat gum disease to: remove only the diseased tissue without removing any of the healthy tissue, maintain the height of the tissue around teeth, minimize pain and discomfort to the patient, get a closure of the periodontal pocket wound and allow healing to take place. Controlling periodontal disease makes it possible to save and restore otherwise hopeless teeth. Do not be alarmed with any color changes or appearance of gum tissue following laser therapy. Gum tissue can turn gray, yellow, red, blue, purple, and “stringy” and reflects a normal response to laser treatments. Some oozing of blood may occur and will appear to be greatly exaggerated when it dissolves in saliva. Determine the side of oozing and place pressure on this area. If you cannot locate the origin of the bleeding, rinse your mouth gently with iced water and apply a wet tea bag to the general area. If medication has been prescribed, please take exactly as directed. Antibiotic pills are prescribed. The entire bottle or prescription should be taken for the stated number of days or weeks. If you are not allergic to Motrin – Generic Ibuprofen (eg. Advil, Nuprin), we will most likely prescribe it primarily to minimize tissue swelling, and local inflammation that is a natural side effect of minor surgery. Ibuprofen is also good to reduce post-operative pain and sensitivity. Ibuprofen is non-narcotic and does not affect your ability to drive. Never place aspirin directly on the tissue of a painful area. Reduce physical activity for several hours following the surgery to maximize healing. Try to keep your mouth as clean as possible in order to help the healing process. Only brush and floss the untreated area of your mouth. 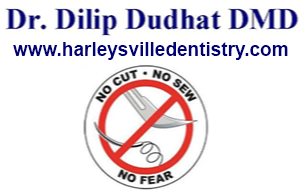 Do not brush or floss the treated area for 10-14 days or as directed by Dr. Dudhat. Do not rinse the day of treatment. You may spit, and gently rinse your mouth the day after treatment. Rinse your mouth gently 3 times a day with the prescription mouth rinse. In between this, rinse your mouth gently 3 times a day with warm salt water (1/2 teaspoon of salt dissolved in an 8 oz. glass of warm water). For the next several days rinse with both the prescription mouth rinse and salt water as previously mentioned but with vigor. You will be on a liquid diet for 3 days, then a diet of “mushy” soft foods for 4 days, and then a diet of smart food choices for the remainder of the month. It is very important to maintain a good food and fluid intake. Try to eat soft but nutritious food such as eggs, yogurt, cottage cheese, malts, ice cream, etc., until you can comfortably return to a normal diet. Please refer to the Post LANAP® Treatment Diet Instructions (listed below). Do not be alarmed that beginning with just 2 weeks after therapy and extending as long as 1 year or more, the teeth may become sore and tender as the bone and ligaments around the teeth regenerate and become more firm. This is a sign of healing, but also indicates the presence of a bite imbalance that may need to be adjusted. “Spaces” between your teeth can result from reduction of inflammation, swelling, and the removal of diseased tissue after the LANAP® treatment. These spaces usually fill in over time, and again, bite adjustment is critical to making sure the teeth and the “papilla” is not traumatized and can regrow. After you complete the program, follow up care and periodontal maintenance visits are extremely important to preserve the work that has been done. The first three days following Laser Therapy, follow only a liquid-like diet to allow healing. Anything that could be put into a blender to drink is ideal. The purpose of this is to protect the clot that is acting as a “band-aid” between the gums and the teeth. Do not drink through a straw, as this creates a vacuum in your mouth that can disturb the “band-aid”. Take daily vitamins. Next four days after treatment, foods with a “mushy” consistency such as those listed below are recommended. Starting seven to ten days after treatment, soft foods may be allowable. The time to start on soft foods is dependent upon the loss of the white material that appeared around your teeth following LANAP® treatment. You were introduced to this material by your doctor or doctor’s assistant during your follow-up visit immediately following your initial treatment session. It was explained to you that you must leave this material alone until it naturally heals and disappears. Once the white material has disappeared, then soft foods can be introduced. Soft foods have the consistency of pasta, fish, chicken or steamed vegetables. You may then, gradually add back your regular diet choices. Please remember that even after ten days, healing is not complete. The first month following treatment you should continue to make smart food choices. Softer foods are better. Chew gum, candy, cookies, chips, nuts, anything hard or crunchy, anything that has seeds or hard pieces, meat that shreds and can lodge under the gum and between teeth, raw vegetables/salad. Healing occurs at an individual’s own rate and is affected by outside influence such as mechanical or bacterial trauma. For example, when you cut yourself and a scab forms, it will fall off as the tissue matures and becomes stronger and more resistant. How long does this process take for you, your father, your brother, your best friend and your son? If there is fibrin or red thrombus still present or if the tissue does not look right, do NOT brush yet. The tissue needs to be mature and strong enough for flossing and electric toothbrush. Tobacco has a very large effect on your gums and the disease you have in them. Tobacco is associated with an increased disease rate in terms of loss of the bone and gums that are holding your teeth in, as well as an increase in the space between the gums and teeth. Tobacco is a major factor for chronic gum disease. Any type of smoking and/or chewing tobacco will have an adverse effect on the progress of your healing and may cause the gum disease to re-occur after treatment. If you are a smoker or chew tobacco we highly recommend not doing so while you are healing or any time after that. For more information on LANAP procedures or any questions, Please call us at (215) 513-9533 or schedule an appointment online!